One thing I love to make with my food processor is nut butter. It is so simple to make and you have total control over what ingredients you add. Some store-bought peanut butter brands, for example, contain ingredients like salt, oil, sugar, shortening, dextrin, and molasses. My homemade peanut butter contains peanuts. And that’s it. You can make whatever varieties of nut butters you feel like. Variety is good. Right now my personal faves are hazelnut butter and almond butter. When you first start out, you will end up with a coarse nut flour. Keep blending and the nut powder will begin to clump. Keep on blending and you will eventually get a smooth nut butter. 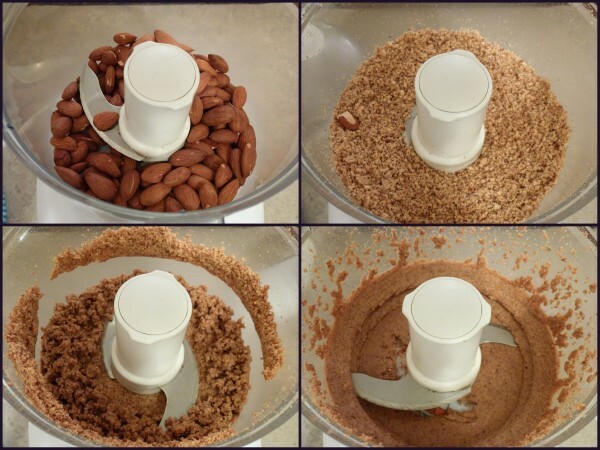 This entire process can take 10+ minutes depending on the quality of your food processor and whether or not the nuts are roasted. As you are processing the nuts, you may feel like they will never turn into butter and may be tempted to add oil, particularly if you are using raw nuts. Adding oil shouldn’t be necessary- just be patient and the nuts will eventually smooth into a paste. Make sure you scrape down the sides of the processor a couple of times with a spatula. It actually makes a really huge difference whether or not you use roasted nuts. Some people swear that using raw nuts is the only way to go, usually for health reasons. Roasted nuts, on the other hand, are much easier to blend into a paste and have a more spreadable texture. Roasted nuts also have a nicer flavour, in my opinion. When nuts are roasted, several chemical reactions occur that alter the nuts’ flavour and texture. These can include a breakdown of the fats in the nuts, lipid oxidation, breakdown of the proteins, and reactions called Maillard browning. Raw nut butters definitely have a raw taste to them and do not spread as well. 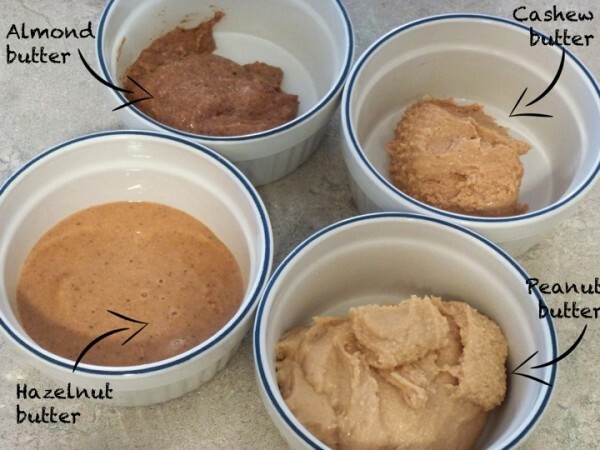 Roasted nut butters spread more easily because, with heat, the fats begin to degrade, which alters their consistency. The extent of the chemical changes in the nuts depends on the heat they are subjected to. The nice thing about roasting the nuts yourself at home is that you have full control over the roasting temperature/time. Also, some store-bought roasted nuts have added oil or salt, which obviously makes them less healthy. To roast the nuts, simply place on a baking sheet and stick in a preheated oven (325-350 F) for up to 10 minutes. Keep an eye on them because you don’t want them to burn! If you are using hazelnuts, transfer them from the oven into a tea towel and rub them until the skins are removed. Then go ahead and proceed with your nut butter-making.